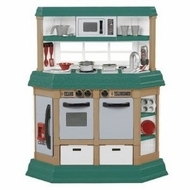 11950 A really nifty, bright kitchen with everything a little chef needs! Featuring realistic burners with light and sounds. Turn the knob to activate the timer. Get ''cooking'' by placing pots or pans on the burners to automatically ativate sizzling an dbubbling sounds. Plenty of shelf space and two removable ''wicker'' baskets for storage! The kitchen has a microwave, refrigerator, oven and dishwasher. Additional features include a sink and 22 play accessories. The burners require 2 AA batteries that are not included. Packaged in a colorful, corrugated carton with full color litho label. Features: -Light up burners with sounds. -22 Accessories!. -Plenty of shelf space. -Requires two AA batteries. -2 removable baskets for storage. -Includes microwave, refrigerator and oven.